Pisa is so small that can be easily visited in one day tour, or even half day. Often comes together with other towns (like San Gimignano or Volterra) as part of a single itinerary with its start from Florence. The advice is to stay there, look for an apartment from a website like this, web site. The most famous monument of Pisa is undoubtedly the Leaning Tower. 56mt tall and with an inclination of almost 4mt, is one of the most photographed monuments around the world. Since few years has been re-opened again to the visitors: it can be climbed up to the top, booking a 15 Euro ticket. But make sure to not suffer from dizziness because once reached the top of the tower, the feeling of being thrown outside is very real. Moreover go up through all the 300 steps (293 exactly) with such incline is not an easy effort (for that reason the climbing of the tower is not allowed for kids under 8 ears age). Time of staying is limited: to climb up, make a couple of pictures and come down must not exceed 30mins. In Piazza dei Miracoli square as much impressing and charming are the Dome of Pisa, date back to 1064, and the Baptistery, slightly more recent (1152). This one is the biggest baptistery of Italy. If you fancy a cappuccino there is a nice bar just at the corner of the square. Once finished with the square, the advice is “to get lost” across the rest of the town. Many churches, squares and monuments will be waiting for you, in a city really on human scale. If you want “breath” some cultural fresh air, go by Piazza dei Cavalieri, where you will find the Scuola Superiore Normale di Pisa (simply called “The Normale”), in other words one of the more prestigious and antique university of Italy (date back to 1810, funded by Napoleon). From here, through the years have been coming out cultural genius and still today has a recognized reputation, especially for the literature education. 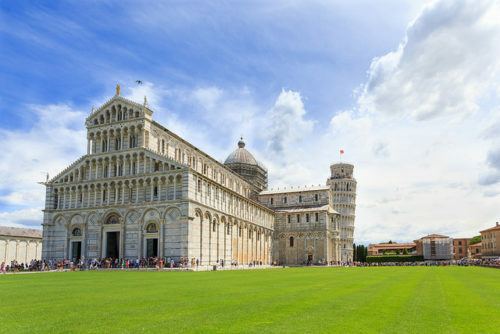 The favourite period for visiting Pisa? Indeed June, for the ideal weather and furthermore because the two main city events are held on this month. Like all the celebrations and historic reenactments, for the nonresident could be odd fully understand the rules of the game that take place on Ponte di Mezzo the last Saturday of June. In the same way as it happens with the Contrade of Siena, the atmosphere around the neighborhoods could seem excessively hot, as hotter as a football stadium: in this case are called Mezzogiorno and Tramontana. It’s enjoyable observing the participation of the city to this race, which consist of pushing a cart along a railway, located over the bridge. Impressive the historic parade that take place before the race too. 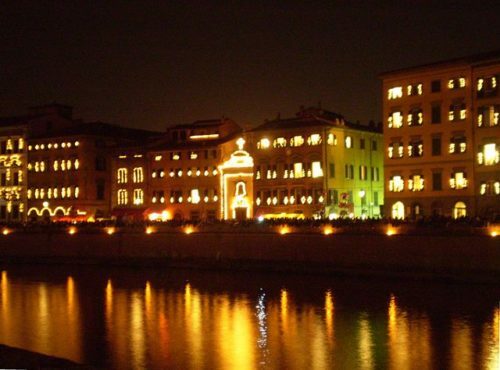 Another unmissable event is the Luminara (or Luminaria), that usually take place the 16th of June, the day before of the Patron Saint Day of Pisa: Saint Ranieri. The Arno river become the main character of an unique show: the building alongside the river get transformed for the event in a way you cannot even imagine. All the windows and window sills of each single palace will host few lights, which at the sunset will transform Pisa in a fairy tale city. 120000 candles are estimated to be used and in fact occur many hours and men to make it possible. Furthermore there are awesome fireworks show, stands and music that embrace the entire town. 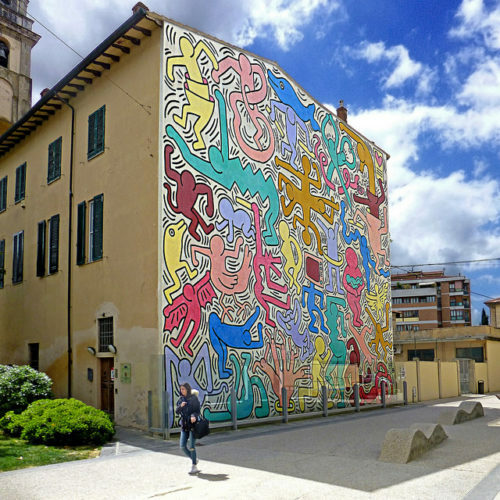 If more than just “old things” you wish to have an insight about contemporary Pisa side, not far away from rail station (you can go by walk), do not miss the murals of Keith Haring. Painted back on 1989, just before his death, thanks to the obstinacy of a young Pisa guy who managed to convince the famous pop artist to leave a piece of his art in the city walls. If you have a car and it’s sunny, make the itinerary a bit longer, you can reach the coast (about 20 minutes). From there you have a double choice: southward for a bath in the sea, otherwise toward the Arno outlet to see the fishing with “retoni” (translated ad big net). You can rent a ride by boat to watch this original kind of fishing technique, passed down years by years. From Florence there are scheduled trains (about 1hr) and bus (included the Ryanair one). The cost of the train ticket is reasonably cheap (not more than 10 Euro). By car is even faster, depends on traffic, with the free highway “Firenze-Pisa-Livorno”. But watch out to not get a fine for exceeding speed limits. There are plenty of speed machines along the way. This entry was posted on Thursday, April 4th, 2013 at 8:51 am	and is filed under Discover Italy. You can follow any responses to this entry through the RSS 2.0 feed. You can leave a response, or trackback from your own site.